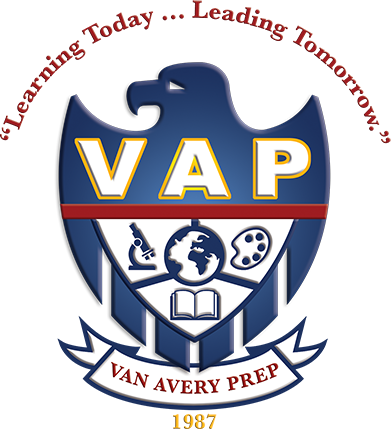 Welcome to the Van Avery Prep family. Here at VAP we consider our school to be one big family that supports one another. As educators we recognize that our students thrive in a rigorous academic environment where students are given the skills needed to become the best they can be. We develop innovators, critical thinkers, humanitarians and leaders. Our students are learning today and leading tomorrow. Please give the office a call to set up a private tour at your earliest convenience. We look forward to sharing with you the VAP Experience! On your tour we will visit several classrooms that are in session, the Art Studio, Science Lab, Athletic Facility and Resource Center. We will share with you our philosophy and go over curriculum. Above all we will go over what we do to pull out the scholar, artist, and athlete in your child.